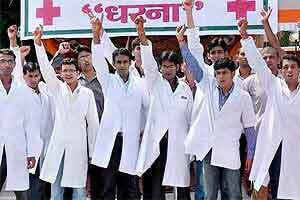 On June 22rd and 23rd, around 20,000 resident doctors of Delhi went on a strike under the banner of FORDA. Their demands included basic necessities of patient care including availability of medicines, generic drugs, surgical consumables, as well as better conducive environment that allowed doctors to practice with dignity. The MCD, Delhi government, Central government all immediately accepted their demands assuring in writing that the issues will be taken firmly and demands shall be met. However, these all seem to be false promises. Within a day of the government assuring to meet the demands, one of the major demands, i.e security of doctors is compromised. Violence against doctors has started. A CMO on duty was assaulted on 24th June at 10:00 pm in Lal Bahadur Shastri Hospital.